1899, Archibald C. Wilson, former vice president and president of the League of American Wheelmen from 1894 - 1895, received a massive silver loving cup as a token of appreciation for loyal service to the organization. Mr. Wilson was vice president in 1894 and president in 1895. 10. 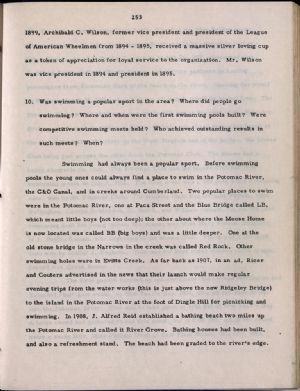 Was swimming a popular sport in the area? Where did people go swimming? Where and when were the first swimming pools built? Were competitive swimming meets held? Who achieved outstanding results in such meets? When? Swimming had always been a popular sport. Before swimming pools the young ones could always find a place to swim in the Potomac River, the C&O Canal, and in creeks around Cumberland. Two popular places to swim were in the Potomac River, one at Paca Street and the Blue Bridge called LB, which meant little boys (not too deep); the other about where the Moose Home is now located was called BB (big boys) and was a little deeper. One at the old stone bridge in the Narrows in the creek was called Red Rock. Other swimming holes were in Evitts Creek. As far back as 1907, in an ad, Ricer and Couters advertised in the news that their launch would make regular evening trips from the water works (this is just above the new Ridgeley Bridge) to the island in the Potomac River at the foot of Dingle Hill for picnicking and swimming. In 1908, J. Alfred Reid established a bathing beach two miles up the Potomac River and called it River Grove. Bathing houses had been built, and also a refreshment stand. The beach had been graded to the river's edge.